The Medicine Nexus is a free on-line guide to Antique Medicine Bottles. The bottles it contains are posted for reference only and are not for sale. H. A. BABCOCK'S RHEUMATIC TINCTURE, BLOOD PURIFIER & CANCER CURE, BROOKFIELD, N.Y.
an Opium based baby killer medicine. CHERRY GLYCERINE JAS. BAILY & SON, BALTO. BAKER'S BAMBOO BRIAR COMPOUND OWEGO TIOGA CO. N.Y.
BAKER'S BAMBOO BRIER COMPOUND S.B.WILCOX BINGHAMTON, N.Y. U.S.A.
E. BAKER'S PREMIUM BITTERS RICHMOND VA.
Dr Ira S Baker worked in conjunction with the Owl Drug Co of southern California. BAKER'S SPECIFIC R.H. HURD PROP. NO. BERWICK, ME. U.S.A.
BAKER'S SPECIFIC NO. BERWICK ME U.S.A.
BAKER'S VEGETABLE BLOOD & LIVER CURE LOOKOUT MOUNTAIN MEDICINE CO GREENEVILLE TENN.
S D BALDWINS LINIMENT MARYSVILLE CAL. 3 sided bottle. Patented by C F With 1884 in Springfield Mass. M Bally was a French doctor at the Paris Hospital who invented a vegetable treatment for VD. The early VD cures often involved injection of toxic mercury. The Lotion was an external treatment and the antidote was an internal treatment. Sold in the 1850s by Duroy & Co in New York. BALSAM OF WINTERGREEN A. M. ROBINSON JR. BANGOR, ME. WESTERLY & WATCH HILL, R.I.
BARBER'S INDIAN VEGETABLE JAUNDICE BITTERS OLIVER JOHNSON & CO PROVIDENCE R.I.
BARKER HAIR DRESSER BD WAY, N.Y. REGISTERED WM JAY BARKER HIRSUTUS NEW YORK..
BARNES' MAGNOLIA WATER NUEVA YORK P. H. DRAKE Y CIA. ALFRED BARTH MALARIA CURE PROVIDENCE R.I.
DR BARTLETT'S VITAL FORCE LOWELL , MASS. BAUER'S INSTANT COUGH CURE MT. MORRIS, N.Y.
DR BAYLEYS SARSAPARILLA ELLIOTT BROS & CO.
S W BEALL M.D. CATARRHAL SPECIALIST TROY,O. DR BEAN'S MAGIC COMPOUND LINIMENT NATICK MASS. BEAR BRAND WILD CHERRY TONIC COMPOUND - THE LEWIS BEAR DRUG CO. PENSACOLA, FLA.
DR BEDORTHA'S BLOOD PURIFIER SARATOGA SPRINGS N.Y.
BEE DEE LINIMENT BEE DEE MEDICINE CO. CHATTANOOGA, TENN.
DR. BELDING'S SIX PRAIRIE HERBS COUGH AND LUNG REMEDY DR. BELDING MEDICINE CO. MINNEAPOLIS, MINN.
DR BELL'S BRITISH LINIMENT S.M. SHAW & CO ALFRED ME U.S.A.
DR. BELL'S PAIN ALLEVIATOR RHEUMATISM ANNIHILATED NEW YORK & LONDON CHEMICAL CO. NEW YORK. DR BELL'S PINE TAR HONEY THE E.E. SUTHERLAND MEDICINE CO., PADUCAH, KY.
DR BELL'S PINE TAR HONEY THE E.E. SUTHERLAND MEDICINE CO. PADUCAH, KY.
BELL'S SARSAPARILLA A.M. ROBINSON BANGOR , ME . 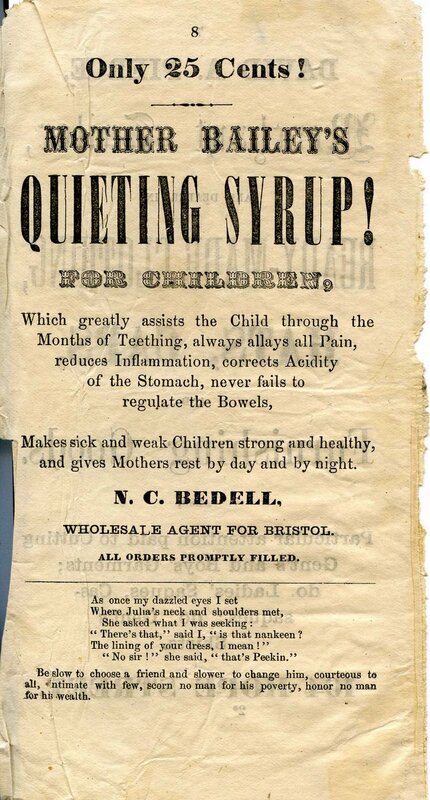 DR BENNETT'S QUICK CURE A.L. SCOVILL & CO.
DR H W BERGNER’S STOMACHIC READING, PA.
DR. BERNARD'S INJECTION D.F. ONNEN, PROP. BALTO., MD. C O BIGELOW DRUGGIST 106 & 108 6TH AVE. N.Y.
H.E. BILL'S MAGIC RELIEF BAY CITY, MICH.
DR. BLACKWELL’S SARSAPARILLA & VERSIECOLA LOUISVILLE, KY.
JNO S BLAKE DRUG CO. CHARLOTTE, N.C.
J BLANCHARD MT. VERNON, O.
BLISS KEENE & CO'S FLUID EXTRACT OF CUNDURANGO, N. Y. S S BLODGETT PERSIAN BALM OGDENSBURG N.Y. BLOOD TABS BLOOD AND SYSTEM TONIC ONE FOUR TIMES DAILY THE REESE CHEM.CO.CLEVELAND O. S S BLOODGETT PERSIAN BALM OGDENSBURG N.Y.
OP, H Eastman Zanesville O.